Tonight we had dinner with the Hartsfields and the Lazos. I can't think of the last time all of us were together at once. 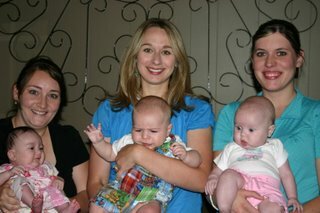 The moms and babies meet regularly, but it's always when the dads are at work. We had so much fun! We had chinese food and Sonic drinks. It was a nice combo. The kids watched Baby Einstein and chilled in Ava's swing, bouncy seats, and exersaucer. Thanks for sharing, Ava! 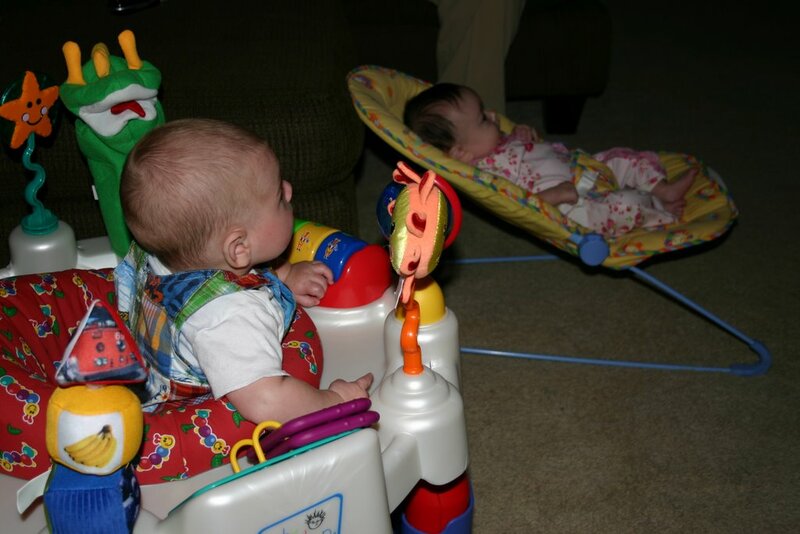 Ava and Jackson watching Baby Einstein before Ella arrived and got the party started. I love the facial expressions in this picture. 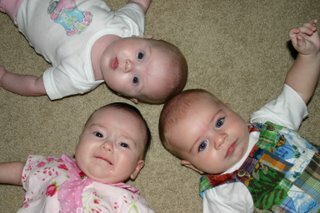 There is no possible way to get three moms and three babies looking happily at the camera in one shot! Ava: "Jackson's gonna fall on me again, Mom!" 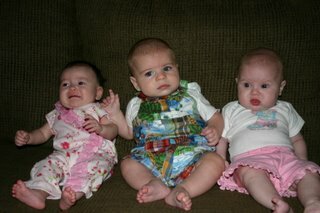 Ella: "I think Jackson pooted." Jackson: "I have no idea what they're talking about." Jackson did fine with his shots yesterday. I had to hold his arms down while he got them. It was so sad. He was bright red and screaming between held breaths. 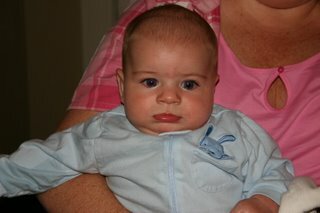 He was really fussy last night, but I would be too if I'd had four shots! 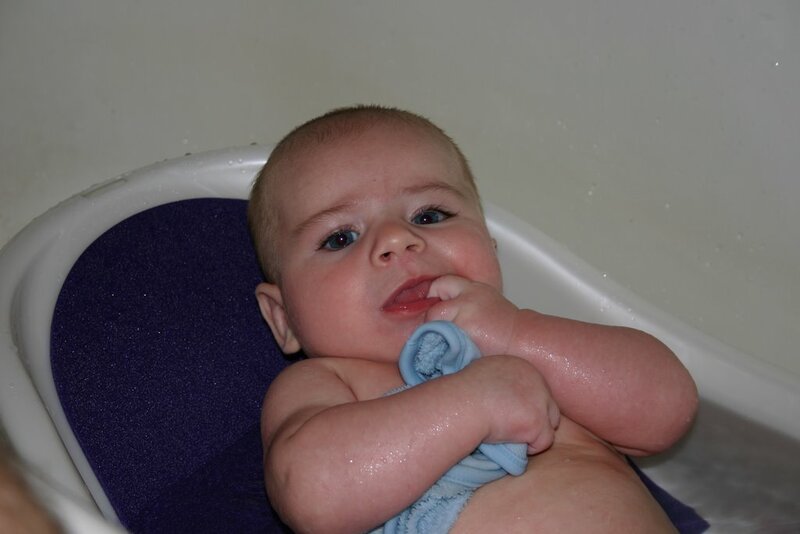 Curtis gave him a warm bath and that calmed him down. Dr. Raja was really happy with his growth and development. 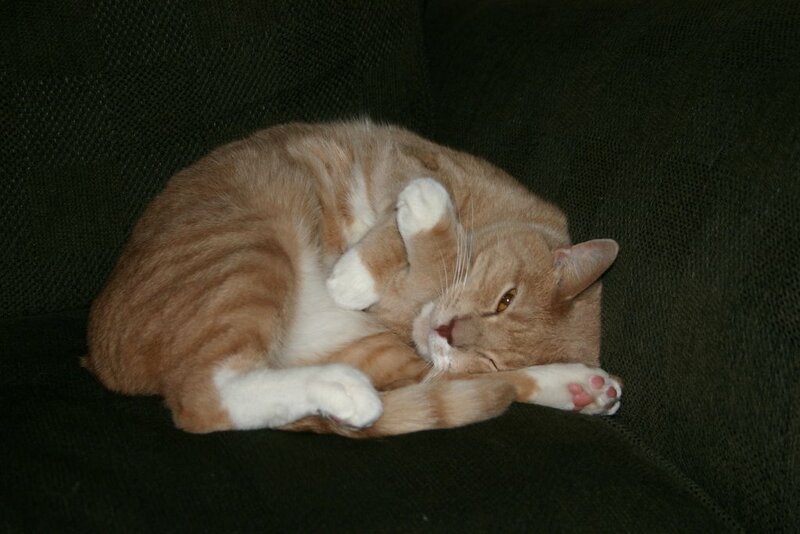 He weighs 16 lbs (75%) and is 25.5 inches long (75%). She gave the go ahead for solids but I think I will wait until after camp. Tomorrow we go see Dr. Raja for Jackson's 4 month shots. I'm very sad to say that Curtis can't go with me because he has to work. That means I have to be the one to hold Jackson's legs while they do the shots. I really, really don't want to do that. But I know there are plenty of moms in the world watching their children go through lots of pain, so I can be brave and do this. I really didn't think I'd be such a softie, but when it's your little baby screaming out of pain and crying tears, it's so unsettling! 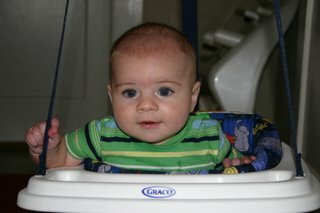 We will find out when Jackson will start solids tomorrow. (Most babies start between 4 and 6 months.) Curtis might have to put the highchair together soon! 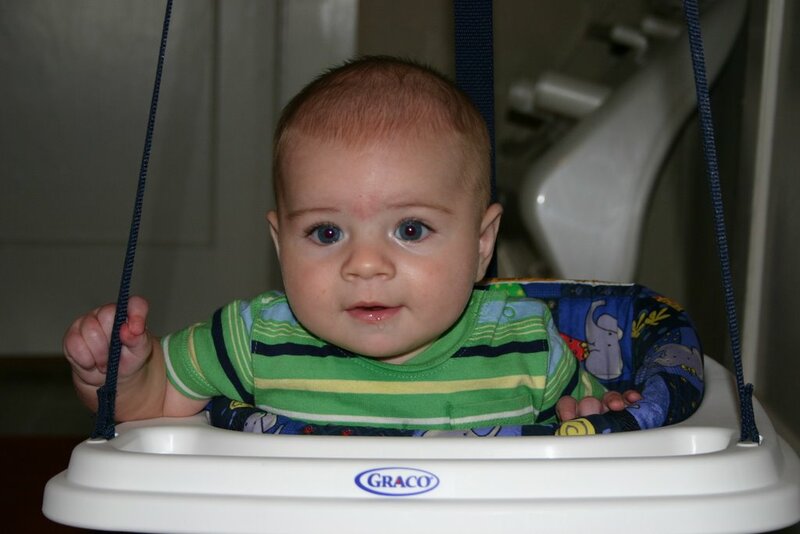 Last week we started Jackson in his full-size car seat. I think if he could talk he'd tell you it's changed his life. He LOVES it! He wants to be more upright these days and the infant car seat/carrier reclines too much. 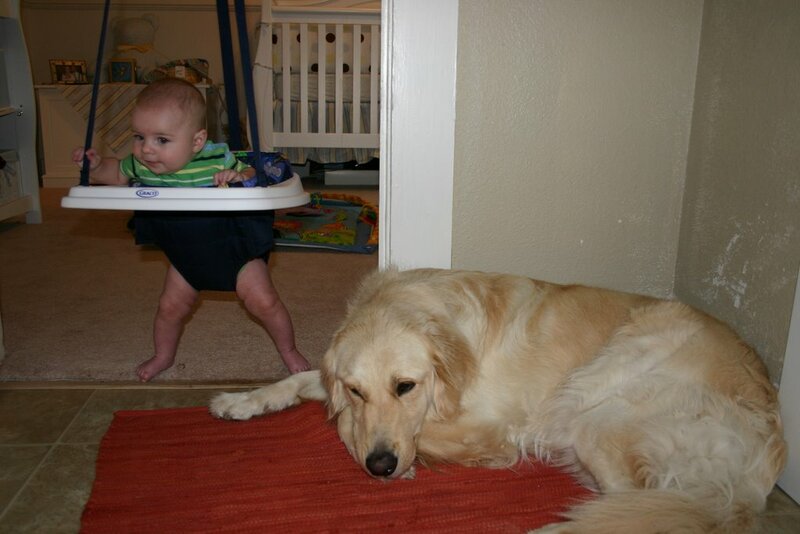 Many people have asked how our pets have reacted to the baby. Bill, our cat, doesn't act very interested in Jackson. He did, however, become obsessed with me while I was pregnant. Our golden retriever, Beckham, thinks Jackson is his baby. He goes everywhere Jackson goes without fail. It will be so fun when they can play together. Dad being the human swing. 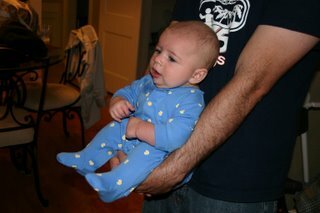 Jackson in his cutest footie pj's. 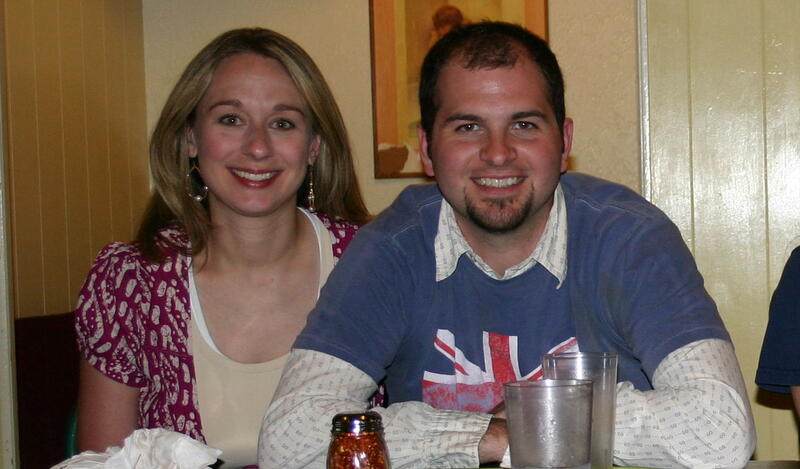 Four years before...at Pappasito's having our rehearsal dinner. Today...at Krystle's Pizza with our youth. First of all, I can't believe Jackson has already been with us for four whole months! Second, I can't believe Jackson has only been with us four months! As I said before, the third month was truly blissful. I'm not so sure about month four. He is showing definite signs of teething now and I'm somewhat nervous about what's ahead. Pray for me! If there are any moms reading this who want to pass on their best "how to survive teething" tips, please leave me some comments. Jackson is 16 pounds now. He can almost reach his toes to his mouth. In fact, he wants everything in his mouth. He's drooling like crazy which is really gross, but he doesn't mind it at all. One new development is that if you hold him facing out and leaning back a bit, he attempts to sit himself up straight. He also spit for the first time the other day. Yes, spitting is different from drooling. He also seems to get more control over his hands every day. Remember when I talked about my hotsling? Well, Jackson just loves it. He literally laughs when I put him in it. He loves facing out. The only problem is when I'm walking through the mall or church or somewhere thinking, "Oh, me and my baby are so cute...la la la la la" he could totally have spit up all over his face and I wouldn't know it. It's definitely humbling when someone points it out to you. Curtis and I celebrated our fourth wedding anniversary on June 15. We went to see Nacho Libre (we both liked it). Our friends Corey and Andy got married in Austin over the weekend at the Mansion at Judge's Hill and we got to stay there. What a neat place! Go there if you have the opportunity. We're really thankful for the journey we've had together so far. I have an amazing husband and I fall more in love with him every time I see my son smile and laugh when his dad walks in the room. Looking cute in my favorite new pants. 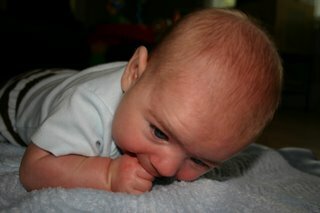 Chewing my fist is my coping mechanism because I HATE tummy time. Mommy's roly poly grabbing his feet. 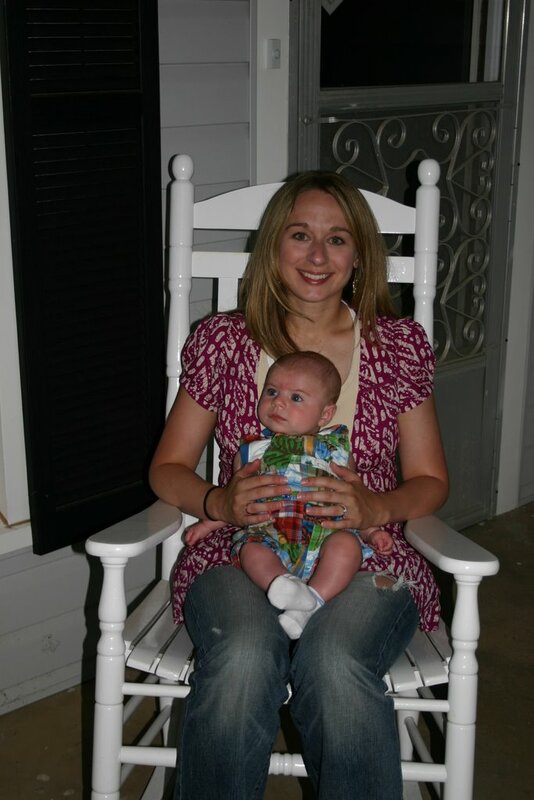 In our rocking chair on the front porch. Jackson enjoyed having his Grandma and Grandpa Jones, Aunt Lindsay, Uncle Matt, and cousin Gavin visit last weekend. We went to an aquarium in Dallas (the cheap one), but he has no idea we were ever there because he slept through the whole thing. But that meant he was wide awake and full of opinions at Campisi's where we had pizza for lunch. They say Campisi's was a mob hangout back in the day. It definitely still reflects that same (dark and quiet) atmosphere. 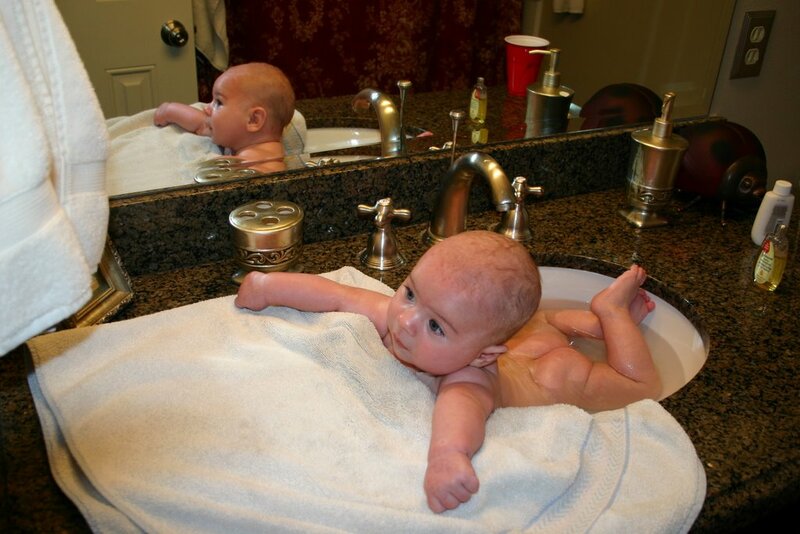 Kinda weird to take a baby in there! 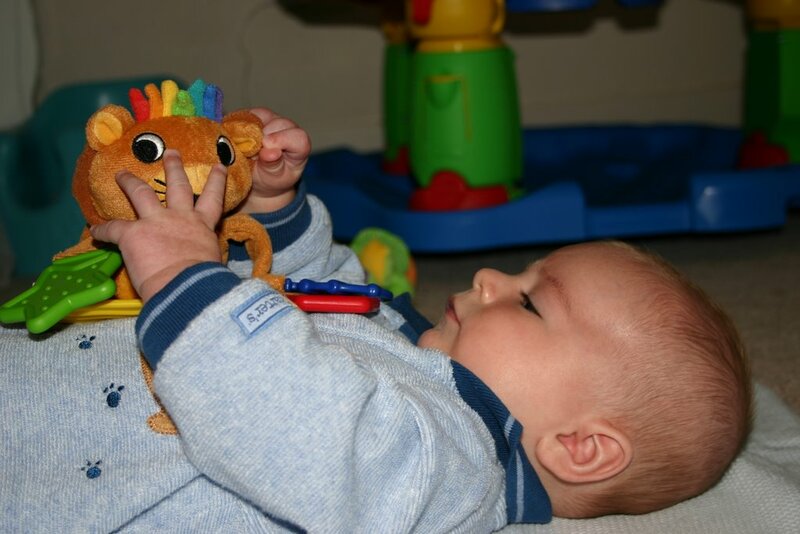 The latest news on Jackson is that he is grabbing and holding on to his toys now. He hasn't rolled over since that one time last week, so apparently he didn't enjoy that experience. I'm giving him plenty of oppotunity to do it again during tummy time. 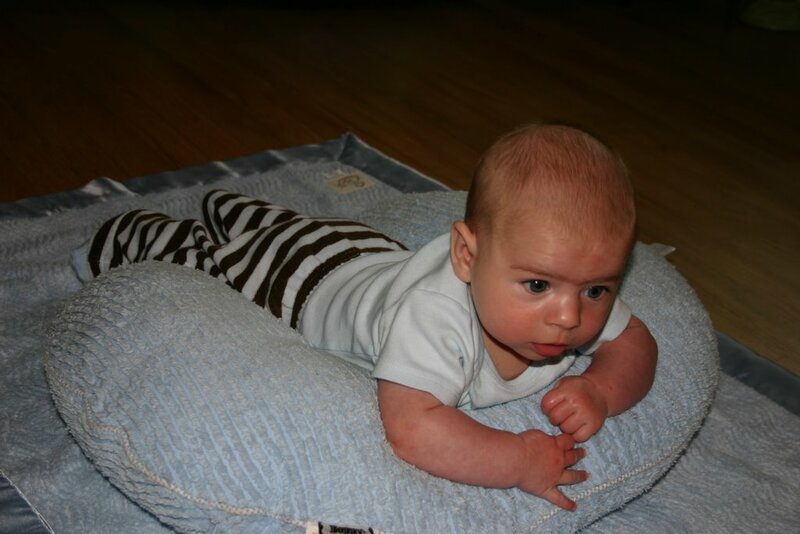 As Madea would say, Tummy time makes him "mad as heck!" You can see in the picture (that currently will not post, but I'll try again later) that he uses his fist as a coping mechanism. 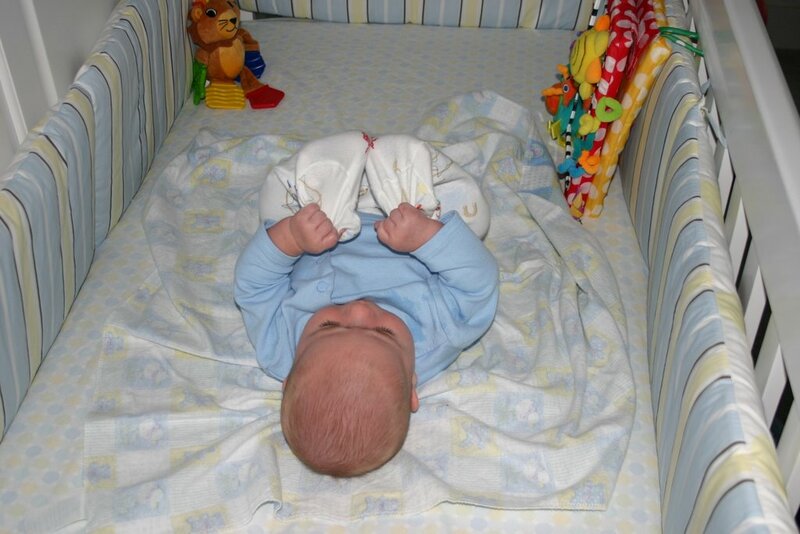 This morning I found him holding onto his feet while he was hanging out in his crib. That was the first time I've seen him do that. Every day is something new! Remember how I've been hesitant to take my camera to the pool? Well, the unthinkable happened...but not to me. Yes, while my wonderful mother-in-law was taking some pool pictures over the weekend, she bent down to show me (in the pool with Jackson) a picture on the screen. To our extreme dismay, the camera slid right out of her hands and plunged into the watery depths. Oh, the horror! Rest in peace, faithful Canon. 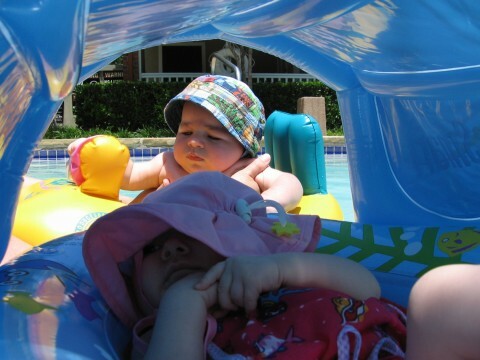 Yesterday Jackson and Ava had a playdate at the pool. It was so fun! Ava's float was like a boat with a canopy over it. The last picture we took was the only way we could get them both close up in one picture. Ava had on a pink sun hat and looked like Strawberry Shortcake. Too cute! 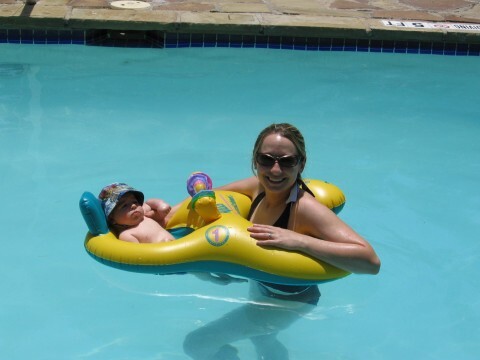 Jackson seemed to enjoy kicking his legs under the water. This morning he went crazy kicking and splashing in his bath. I guess there's no going back now! 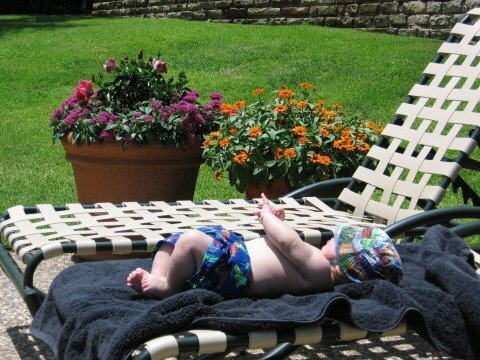 As you can see in the picture, I put him on a towel on one of the chairs to change him and he relished laying there in the sunshine. I will have to be really, really careful ever doing that again because this morning we had a very big milestone. 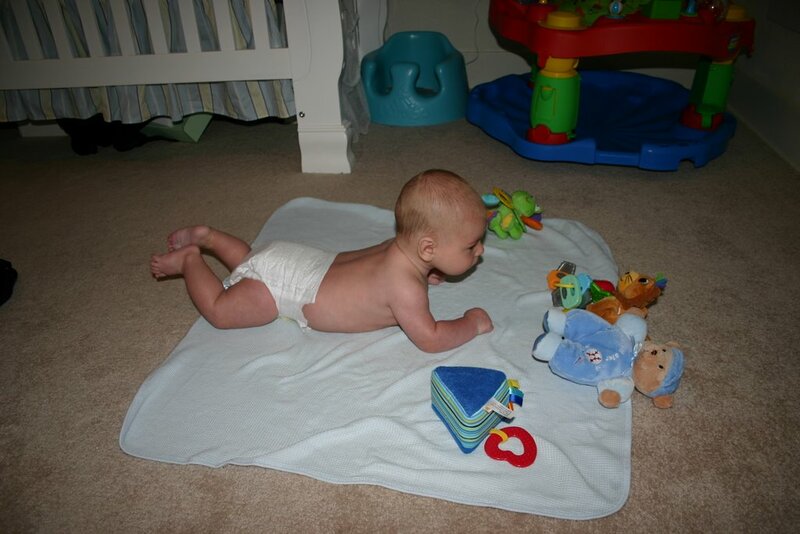 Jackson rolled over for the first time! He went from his tummy to his back. Then he laid there looking very shocked and very proud of himself for a couple of minutes. 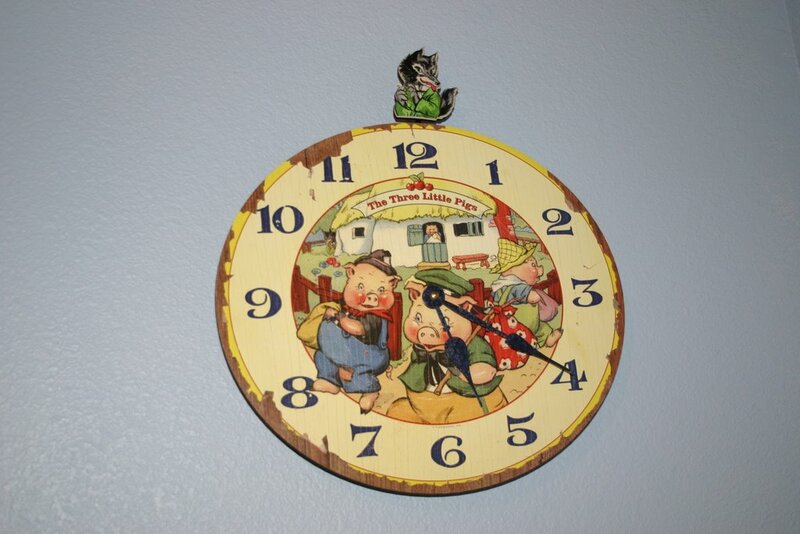 This Three Little Pigs clock has a Big Bad Wolf pendulum. My view from the glider that I spend lots of time in. View from one of the doorways. Another view from the same doorway. 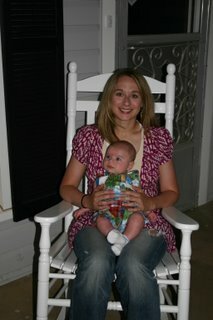 The wonderful old rocking chair that Bonny and David gave Jackson. Bonny made the pillow. She's every woman! You might be able see the burp cloths Bonny made to match the pillow. They're too cute to use! I love this room so much. I wish I had pictures of what it looked like before we renovated the house. It had two huge, hideous wardrobes that were built into the walls, three doorways (not counting the closet), and a window that looked into the back of the house. Weird, I know. We walled up the third door and window and tore out the wardrobes. 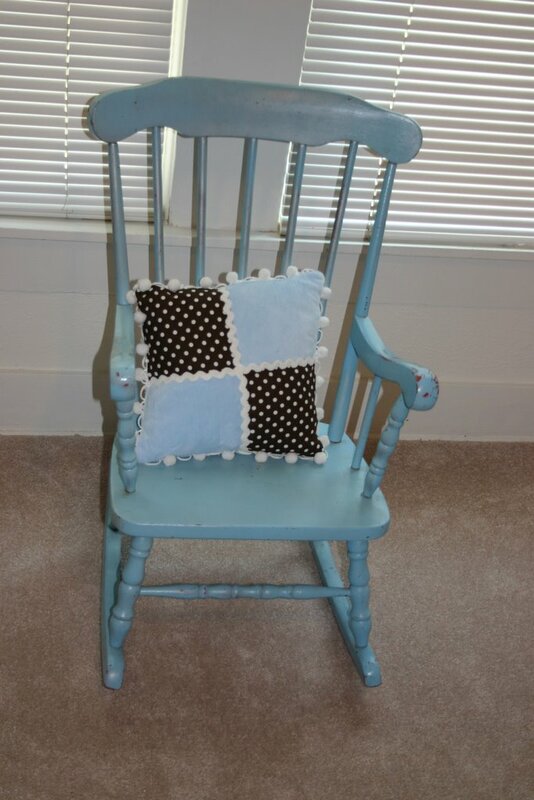 We painted it blue and white and added the chair rails. The room also had a wood floor before we put the carpet down. 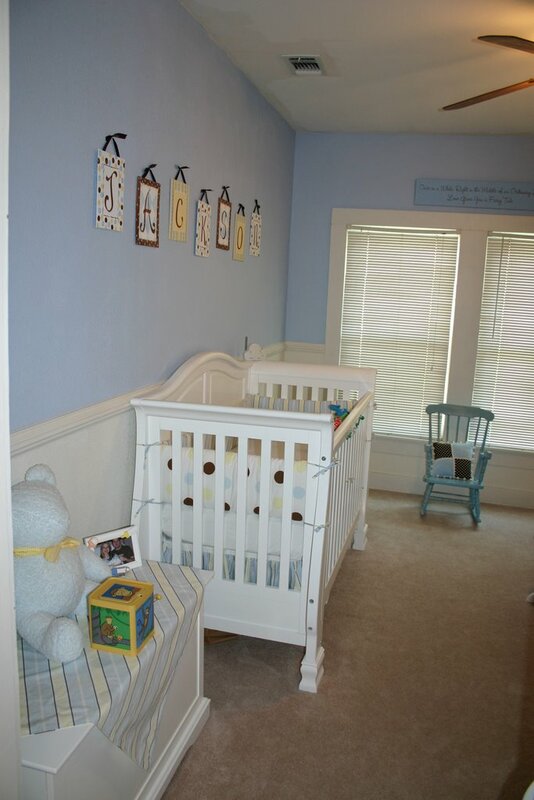 The nursery was the workroom for the carpenter during the five month remodeling process and the floor didn't look very good by the time it was over. We also got the carpet because I wanted a soft surface for Jackson to play on since our living room has a hardwood floor. 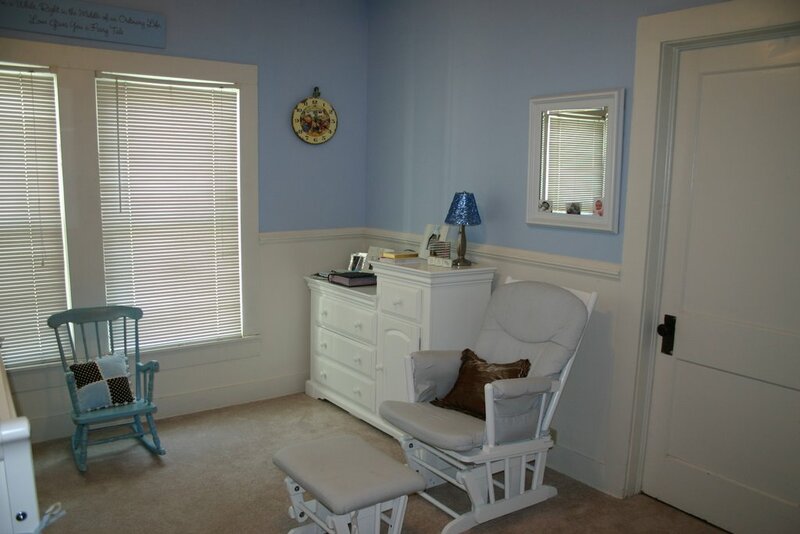 Out of everything we did in our 80-year-old house, I'd say this room had the most change. 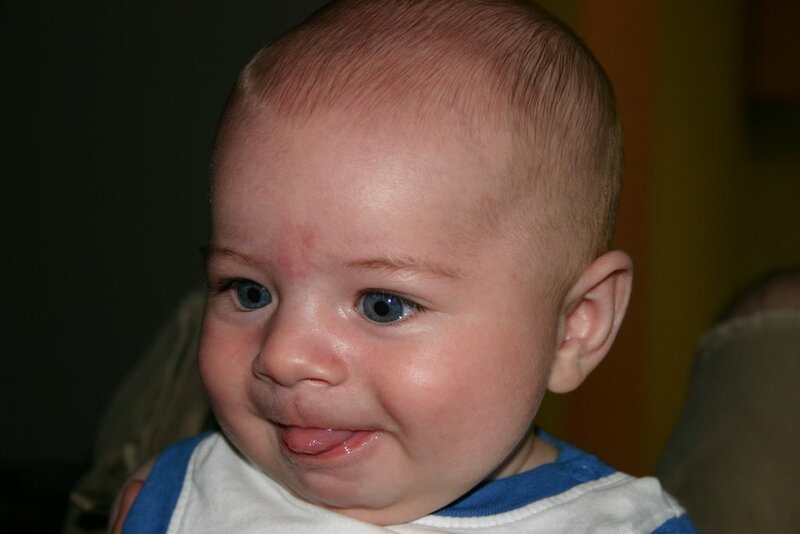 Jackson discovered his tongue and had it sticking out all day. 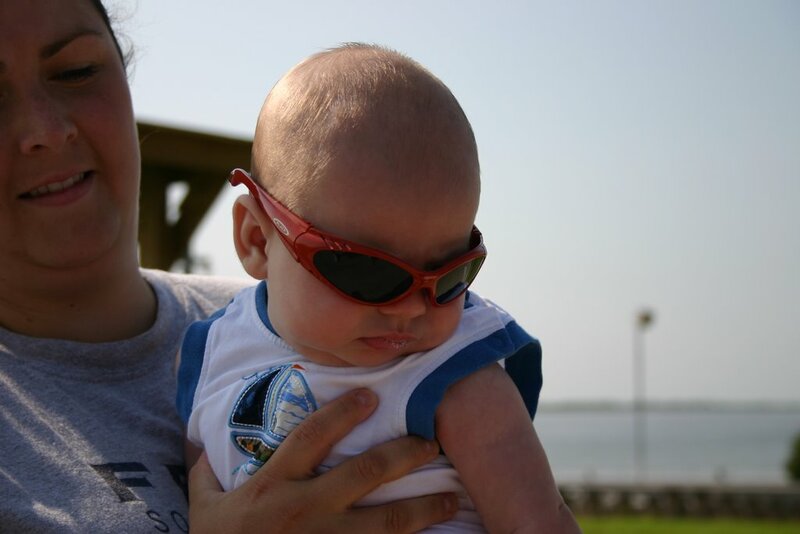 His shades were a little too big. Getting a bath at Grandma's house. 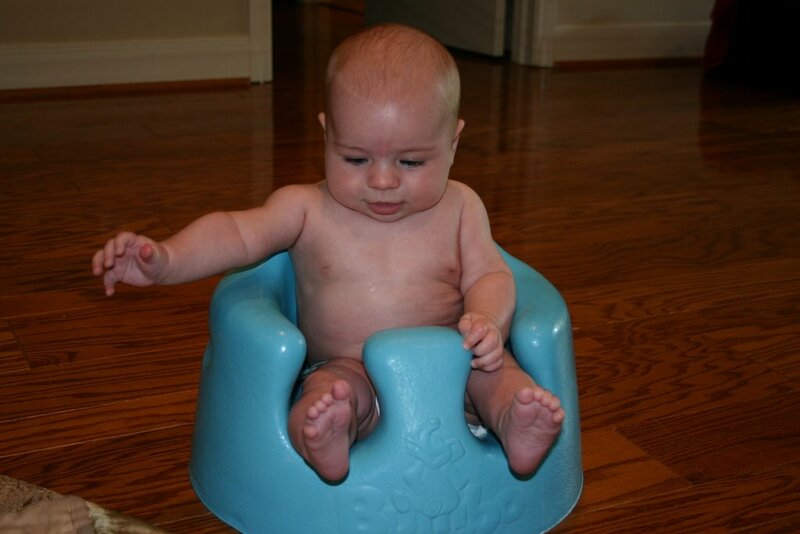 This is the bumbo seat. It looks like he's riding a bronco. 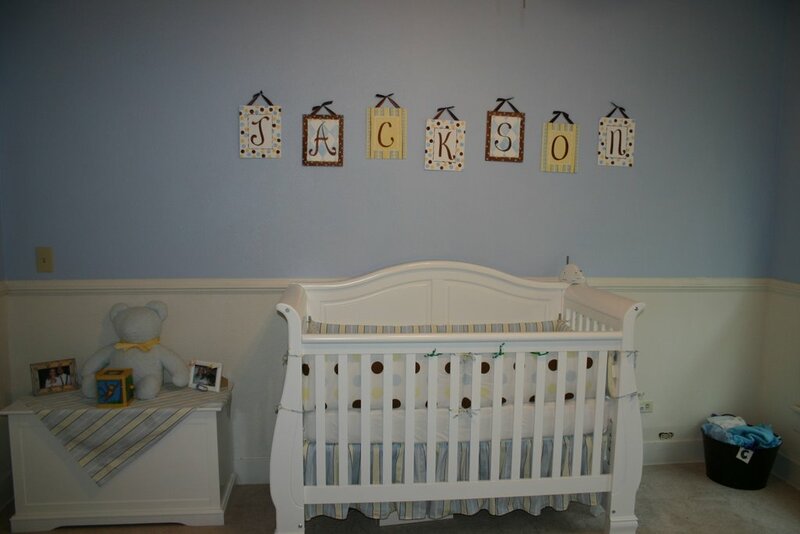 Jackson's precious life began at this exact time last year. Finding out we were going to be parents was huge. Our whole way of thinking began to change...along with my figure and my moods! I remember the first morning after I found out about the pregnancy. Before going to sleep I had wondered how long it would take me to remember the baby when I woke up. It was my first waking-slash-sleeping thought. 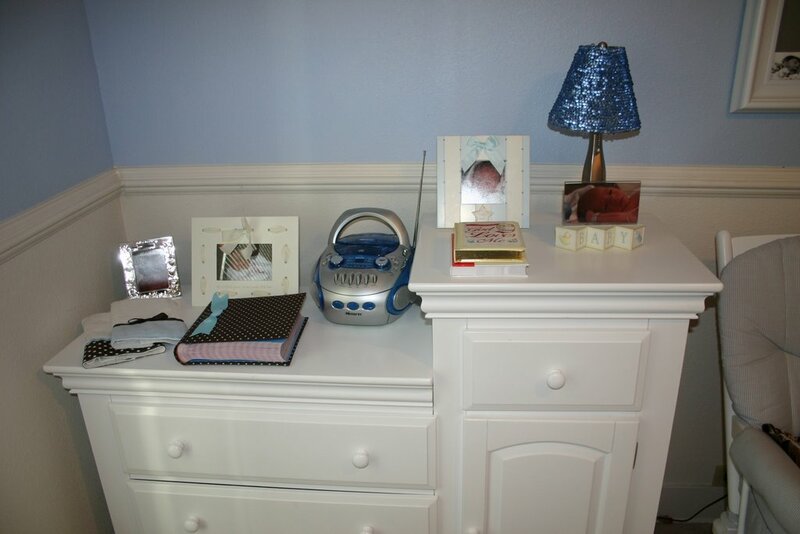 It amazed me that I had complete consciousness of my child even before I was fully awake. One thing I've been thinking about is how the Word says a mother would be more likely to forget the baby at her breast than God would be to forget about us. Isaiah 49:15-16 says, "Can a mother forget the baby at her breast and have no compassion on the child she has borne? Though she may forget, I will not forget you! See, I have engraved you on the palms of my hands." (It's really God talking to Israel, but I think it still counts.) Now that I have experienced the love a parent has for a child, I have never felt so loved by God. It's so amazing to think about my expectations of who Jackson would be and what motherhood would be like. When I compare them to reality, reality far surpasses my former expectations. What a joy! How many times in life can you really say that? Jackson is the most delightful little person that I have ever met. He makes me laugh a thousand times a day. Did you know that I have recently become a songwriter? In the last month I have written probably three songs a day. 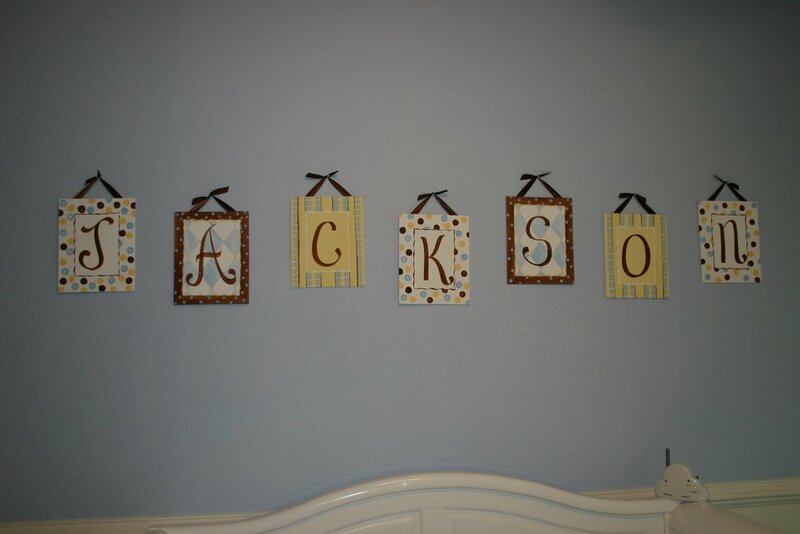 All for Jackson of course. He thinks I sing really well. (And he's the only one!) The sad thing is I can't really remember the songs to sing them again the next day. A few weeks ago I lost my voice and it was so sad not to be able to make up silly songs for him! One of Jackson's favorite songs that I didn't make up is an old hymn called "I know whom I have believed." He can be having a complete emotional breakdown and become utterly peaceful whenever he hears that song. It's really weird! We had a great time at Middle School Camp Houston. We got to see many dear friends from HFBC. Jackson got to swim for the first time and he did great with it. Next time in the pool will be better because I'll have a float for him. 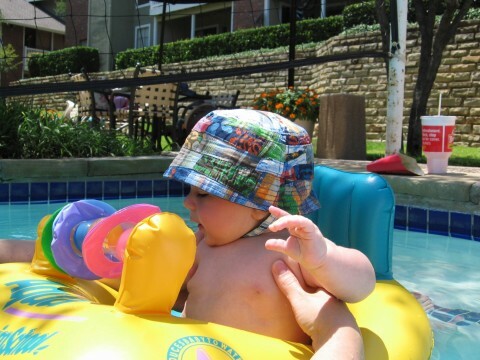 We didn't get any pictures because I was too afraid to bring my awesome new camera to the pool. What a dilemma that was!